Áskell Másson (b.1953) is amongst Iceland’s leading composers, with a varied background as a woodwind player, percussionist, producer, and administrator. Artists including Christian Lindberg, Evelyn Glennie, and orchestras such as the New York Philharmonic, Cleveland Orchestra, and the Vienna Radio Orchestra have performed his music. He has also composed two works for solo trombone, Cadenza and Monologue and a concerto for trombone and orchestra, Canto Nordico. 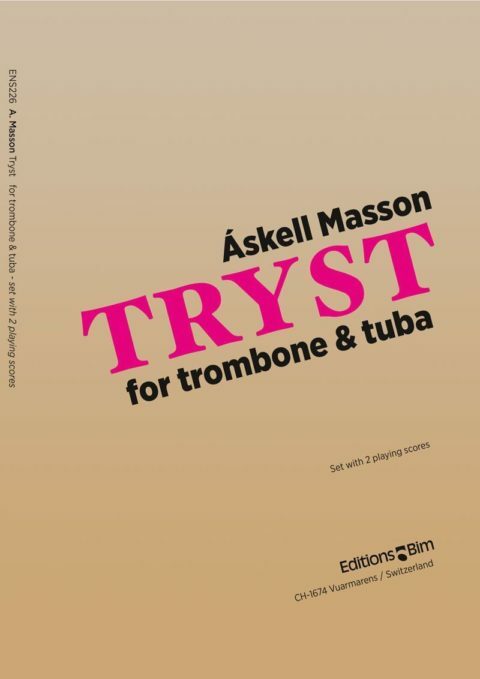 Tryst was composed in early 2008. With this piece, I wanted to show some of the natural and subtler colors of the trombone and tuba. Using a folkloristic melody in a predominantly lyrical way, the instruments use different techniques to achieve these shades of color. There was no actual commission for this piece, I wrote it out of my own interest between two large symphonic pieces I was working on. The premiere took place in Reykjavik, in 2009, with Sigurdur Thorbergsson on trombone and tubist Per Forsberg. Tryst is traditional in terms of harmony, rhythm, and melody. There are numerous mood, tempo, and color changes. One interesting color comes in the tuba, when required to sing pitches through the horn while simultaneously moving all valves. Technically it is within the grasp of good, undergraduate level performers. As is the norm for Editions Bim publications, the paper quality, printing and artwork are all first class.